There are occasions when I will look through my back catalogue and come across an image which I have not processed before. It can be fun, a voyage of discovery as I search through various folders hidden away in Lightroom, my default workflow program which I have used since 2009. 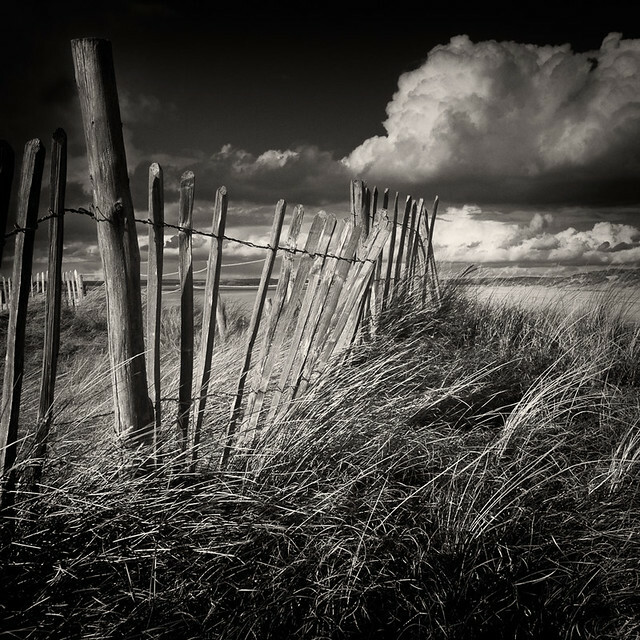 The above image of a fence on the dunes at East Head in West Wittering was taken in October 2012. When I first opened the shot, I thought it had promise and I immediately applied a square crop to the portrait 3×2 aspect ratio, as there was too much foreground and too much sky above the clouds. I also decided that I would process the image in a different way to my usual approach. After a quick black and white conversion in Lightroom, I exported the file into Photoshop, created a duplicate layer and smart object so that I could continue working on the image in Silver Efex Pro2. After a few minutes of processing in Silver Efex, which included adding a ‘coffee’ tone, I returned to Photoshop for some fine tuning and the finished result heads this entry. Total processing time about 15 minutes. For me I enjoyed returning to a set of photographs taken about 18 months ago. Reliving the memories of a wonderful afternoon on the sands and the lovely cloud formations which are of course a key feature of this particular shot. I very rarely delete any photographs from my catalogue, unless they are obvious duds from the outset, and this is the reason why. Going back in time can reveal some new images which have some merit and are worth looking at in a fresh light, using perhaps some newly acquired processing skills to create an image which can be classified a ‘keeper’. Looking through the archives again…..another fence in the dunes.